"Amazing! From contacting Hannah (Degs), who put us in contact with Daniel Lodwick. It was a very smooth transition. Daniel came and we sat down to construct a plan for our first phase of window replacement. Billy and crew showed up this morning and they got right to work. The windows look AMAZING. They even vacuumed before leaving. So looking forward to phase 2 in 2019. We are THRILLED with our new windows." "“We are well pleased with the finished product. We would not hesitate to recommend your work to others.”"
"“Very satisfied – will (and have) recommended your company to others.”"
"“I will not hesitate to recommend your company to any of my friends contemplating a similar project.”"
"“We were very pleased with the entire job and will pass on the name.”"
"“Great job! I’m a very satisfied customer and would do business with All American again.”"
"“We are very pleased with our new window. Would highly recommend your company to anyone.”"
"“All American comes with high recommendation. 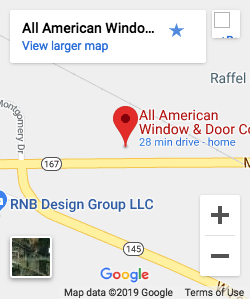 We love our new windows!”"
"“We would highly recommend you to friends and we will be return customers.”"
"“I would recommend All American without reservation.”"
"“I will highly recommend All American Window & Door Co., Inc.”"
"“Excellent service – that’s why I’m a repeat customer.”"